For as much as I love the holidays, it's crazy how anxious I get for nearly the entire month of December. I usually worry so much about Christmas coming too fast, that I almost miss everything in between. My love for Christmas time rivals my love for the Olympics (if you didn't know, I am kind of a fanatic for International sports competitions). And while I am spend so much time making sure the tree is trimmed just perfectly and all of our holiday actives are scheduled, somehow it all seems to swirl around me while I stand all wound-up in the middle, forgetting to live in the moment. Does anyone else get that way? In typical Tessa fashion, I actually made this cake over a month ago with hopes of sharing it at the beginning of the season. You see, I have all these good intentions that include advanced planning to ensure some stress-free fun and more time to enjoy with my family, but sometimes things don't always go the way they were intended to (I'd totally be lying if I told you that I stick to a strict editorial calendar and purposefully saved this recipe for #CakeWeek). For once, let's not be so hard on ourselves when things don't go exactly according to plan. So instead of worrying about all the things I still want get done (and those that were skipped over) this season or the recipes that didn't make it up on the blog in time, I'm going to remember the good times and great flavors that surround this cake. I made this cake when my in-laws came to visit and graciously bought me this gorgeous new bundt pan. I haven't made too many bundt cakes in my day, but my husband remembers eating plenty of them with his family - especially lemon ones. With family around I try to have a fresh, delightful dessert for snacking and sharing - one that is not being repurposed from after a photo shoot or an okay-version leftover from recipe testing. When my in-laws are here, we tend to get so distracted with the baby and all the visiting that we try to jam into their quick trips that we usual just spend most of our time around the living room, ordering in for nearly all of our meals. After long days of baby giggles and tickles from the grandparents, a slice of this cake was the perfect treat to end the nights with. 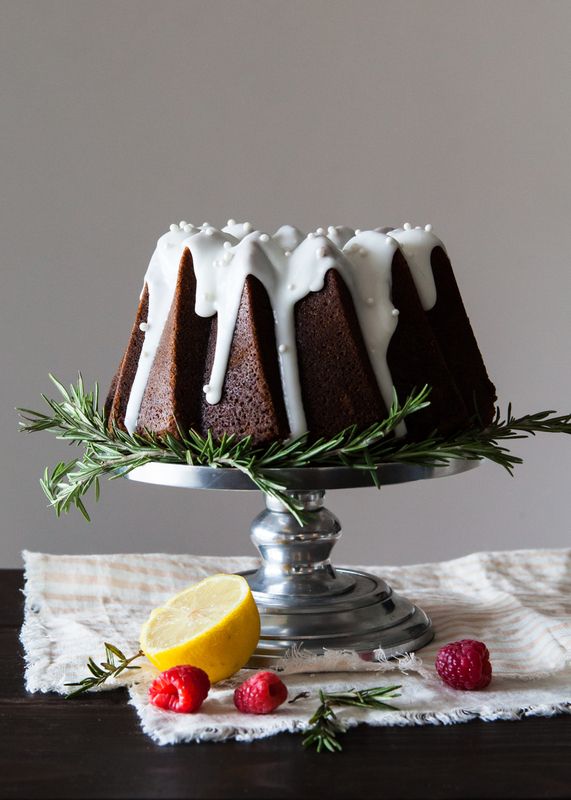 I incorporated my husband's memories of lemony bundt cakes into this Lemon Gingerbread Bundt Cake for the holidays. Instead of other gingerbread cakes that tend to be a bit heavy, with deep, overpowering molasses flavours, I lightened this one up a bit. I used fizzy, zesty ginger beer (my favorite!) with the addition of baking soda to make things extra bubbly and fresh. Maple syrup was also used to cut some of the molasses. 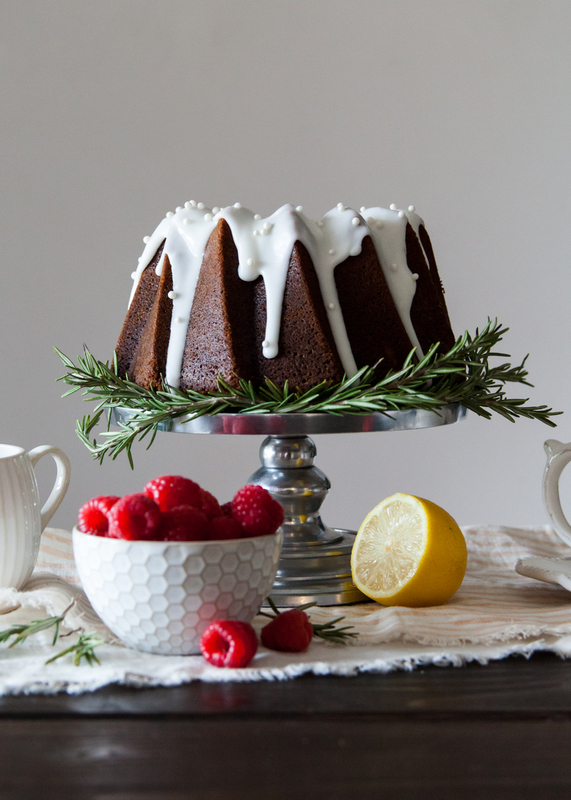 The tart and sweet lemon glaze pairs wonderfully with this lightened-up gingerbread bundt cake, as well as fresh, juicy raspberries. Preheat the oven to 350 degrees. Liberally grease and flour a 10-12 cup bundt pan and set aside. In the bowl of an electric mixer, beat the butter until smooth. Add in the oil and sugars. Mix until combined. Gradually add in the eggs, one at a time. Mix until blended (batter may appear a bit curdled at this point, so be sure to scrape down the sides and bottom of the bowl). In two batches, mix in the dry ingredients until incorporated. In a separate bowl, mix together the remaining liquid ingredients, plus the baking soda. Beat the liquid mixture into the batter until smooth. Pour the batter into the prepared pan and bake for about 55 to 65 minutes , or until a wooden skewer inserted into the center comes out with few to no crumbs. Cool on a wire rack until you can safely handle the cake pan (about 20 to 25 minutes). Run a soft silicone spatula around the edges (being extra careful not to cut into the sides of the cake). Place a large serving dish, cutting board, or cool rack on top of the pan and carefully flip it over to release the cake. Let cake continue to cool on a cooling rack. Whisk the ingredients together until smooth. The icing should be very thick but still be able to drip down the sides of the cake. It should fall in thick ribbons off of a spatula. Add more/less lemon and sugar until the correct consistency is achieved. I am slowly adapting to city living, but there are definitely a few things don't fit into this new lifestyle. I would not trade my high-rise view for anything, but living and working in 700 square feet forces you to become adaptable. Just on the horizon from my balcony I can see mountain tops and the beauty Mother Nature grants the Pacific Northwest. While it is still a bit to cold for camping, I find myself daydreaming of a perfect world of both the hustle-and-bustle and serene wildlife. For now, I will just have to make do with what I have. And to help, I've got a fantastic INDOOR GINGERSNAP S'MORE recipe on my side. I am drawn to flavors with a kick. I love the warmth of cinnamon, spice of cloves, and a good punch of ginger. Back in Cali, I used to snack on these delicious dark chocolate- covers ginger pieces from Trader Joe's. They had the perfect balance of flavor that could get anyone through the afternoon lulls of a rough workday. Since I am currently sans Tj's, I decided to incorporate this flavor pairing with the essential s'more component, marshmallow. The big, chewy ginger cookies are hand-dipped in dark chocolate and layered with fluffy marshmallow cream. The cookies are not overly sweet, so they are a perfect balance for the ooey marshmallow. 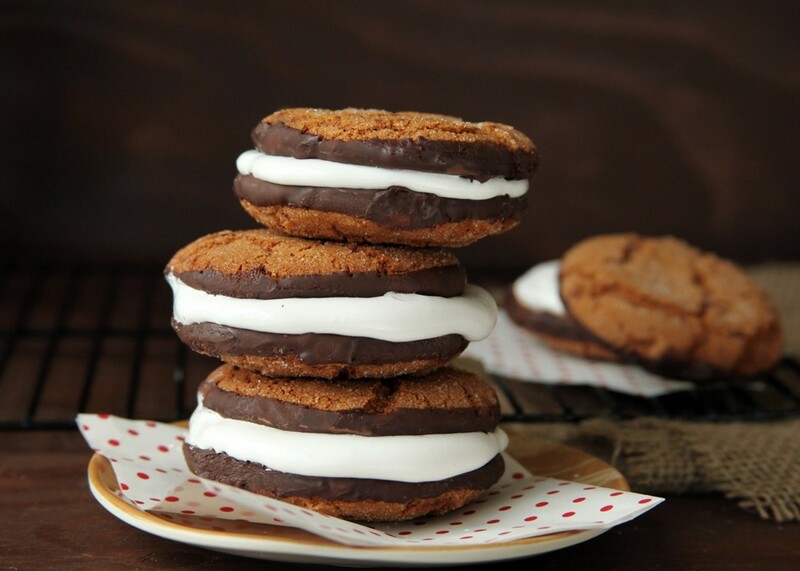 The spices from the cookie act as great substitutes for the smokey flavor that is traditionally associated with s'mores. 2) In a medium saucepan, combine coconut oil and brown sugar and place over medium heat. Melt oil while stirring in the sugar. 3) Remove oil mixture from heat and pour into the bowl of an electric mixer. 4) Once the oil mixture has dropped back to room temperate, beat in the egg, honey, and molasses with a paddle attachment. 5) Gradually add in the dry ingredients and mix until just combined. 6) Using a rubber spatular, incorporate any dry dough from the bottom of the bowl and fold in the chopped ginger. 7) Using a medium-sized disher or tablespoon, create 1-1 1/2" balls of dough and toss in the granulated sugar. Place on a non-stick cookie sheet or silpat mat. Moisten figures and gently pat down the cookies. Be sure to place cookies at least 11/2" inches apart. 8) Bake for 12-13 minutes, or until tops are cracked and centers have cooked. Do not over bake. Remove from oven and let rest 1-2 minutes before transferring to a wire rack. Melt chopped dark chocolate in a double boiler, about 8 ounces chocolate for 16 cookies. Once melted, removed from heat. Pour chocolate into a shallow and carefully dip the bottoms and edges of the cookie in the chocolate. Let dry on a wire rack. Use a small disher or ice cream scoop to place marshmallow cream on half of the cookies. Sandwich with the remaining cookies and enjoy!